ExploreHope kicks off its 21st summer of instruction in the arts and sciences on June 11 with educational outreach programming to more than 1,000 local K-12 schoolchildren. But ExploreHope’s mission is not confined to only June and July. Did you know ExploreHope offers active Saturday programming during the school year? Did you know ExploreHope provides opportunities for eager Boy and Girl Scouts to obtain merit badges and learn lifelong lessons? Being in the know, for all ages, all year-around — that’s what ExploreHope is all about. Hope student Sammy Van Hoven, right, instructs scouts on the comparative vertebrate anatomy of a stingray. A wide range of 50+ hands-on ExploreHope camps will be taught by 18 Hope students and led by Director Susan Ipri Brown for eight weeks this summer. But during the academic year, ExploreHope outreach includes Scout Days from October to June, also taught by Hope students. The programs are created in partnership with Girl Scouts of America and Boy Scouts of America so that participants can earn badges by “Thinking Like an Engineer” or serving on Earth Day or learning about environmental, nuclear or veterinary science. 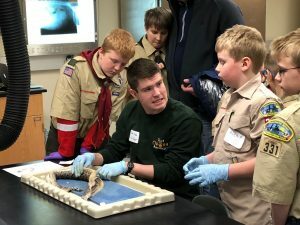 Hope student Joe Joe Fifer, center, instructs scouts on the comparative vertebrate anatomy of a snake. 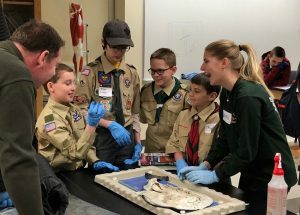 In April, Hope’s award-winning Club Animalia sponsored a Scout Merit Badge Day in veterinary medicine for 20 scouts (and some parents too). For four hours, 10 Hope pre-vet students delivered lessons about various parasites (showing their life cycles and clinical signs of the parasitic disease), urinalysis (showing the chemical breakdown of normal pet urine and signs of irregularity) and comparative vertebrate anatomy (showing the anatomical differences between dog, cat, goat, pig, turtle, snake and sting ray specimens). A trip to Hope’s Van Kley Animal Museum concluded the day. There the scouts explored, with Hope students’ help, the large collection of live animals, including small mammals, amphibians, reptiles, fish and birds. For recent Hope graduate Joe Joe Fifer ‘18, a biology major who plans to enter vet school in a year, the high-work, high-energy day was rewarding. Though it took a good deal of logistical organization and creative instruction, the ability to give back and tout a discipline he loves was well worth it. Hope students Asia Rubio, center, and Luke VanBlois, rear, show scouts various small animals in the Van Kley Animal Museum in Hope’s Schaap Science Center. The near-peer situation of college students teaching teenagers and tweens has its distinct benefits for both populations. 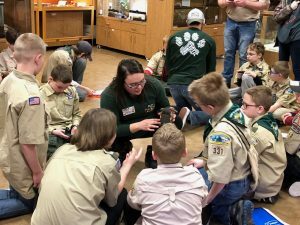 Besides Hope students experiencing real-world lessons in leadership, instruction and accountability, the scouts also receive encouragement and academic expertise from those who are really not that much older than they are.